​Brighton host Southampton at the Amex Stadium on Saturday in what is a pivotal game for both sides in the battle against relegation. Southampton, however, have two wins in their last three - including a dramatic turnaround in the 2-1 defeat of Spurs - and will also be confident heading into the game. With just a few points separating the sides, three points for either team will be huge in their push for Premier League survival. Check out 90min's preview for Saturday's game below. ​Brighton have no major injury concerns, but manager Chris Hughton is sweating on the fitness of a couple of players. Pascal Gross has missed the Seagulls' last three matches with a hamstring injury, but will possibly recover in time to be available for selection. Similarly, Florian Andone could return, having pulled out of the game against ​Crystal Palace, and subsequently missed the match against Millwall. Midfielder Yves Bissouma is available for selection once more, having missed the tie against Millwall through suspension. Meanwhile, Southampton are still missing Mario Lemina and ​Danny Ings, who have been absent for the Saints with long-term injuries. Michael Obafemi has been ruled out for the rest of the season due to a hamstring injury, while Shane Long is doubtful after a groin injury meant he had to miss Ireland's European qualifiers against Georgia and Gibraltar. Brighton Ryan; Montoya, Dunk, Duffy, Bernardo; Knockaert, Propper, Stephens, Bissouma, March; Murray. Southampton Gunn; Valery, Bednarek, Yoshida, Vestergaard, Bertrand; Ward-Prowse, Romeu, Hojbjerg; Redmond, Austin. 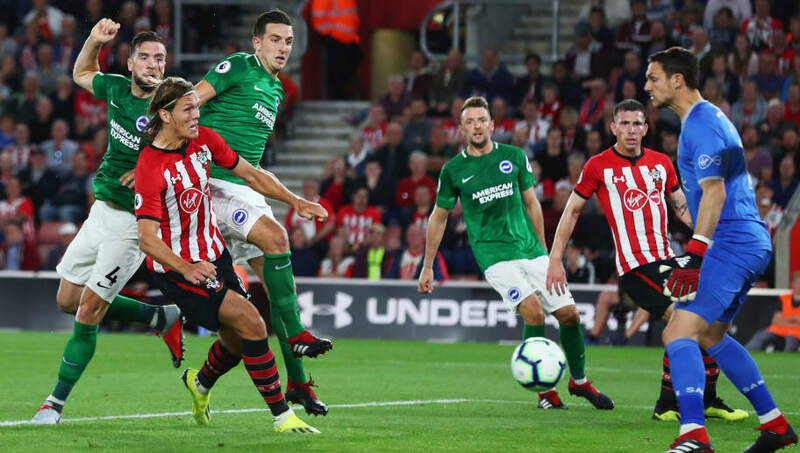 Since Brighton returned to the Premier League in 2017, the two teams have been evenly matched, with three draws in the league and only a narrow Southampton victory when they met in the League Cup back in August. The league clash earlier this season saw a dramatic finish, with an injury-time Glenn Murray penalty enough to salvage a 2-2 draw after the Saints had gone two nil up. Both sides have faced off against each other 70 times throughout their history, with Southampton leading the way with 33 victories as opposed to Brighton's 17 wins, and 20 games ending in a draw. Both sides have two wins in their last three league games, while over the last six they also have identical records of two wins, a draw and three losses. While Brighton have a game in hand over their opponents, there is only a three point difference between the clubs, making the encounter intriguing and close to call. A win for Brighton will likely ensure survival, but defeat will have them looking over their shoulder at the likes of Burnley and Cardiff City. Winning three points will be massively important for both of these clubs as they try to survive against relegation, especially in a match that is a typical 'six pointer'. Both teams go into the game with even form, and so it is a difficult one to call. While Brighton have the home advantage, Southampton have put in impressive performances recently against top six opposition in Manchester United and Spurs. Either way, expect a tight affair, with Southampton perhaps the more dominant team.